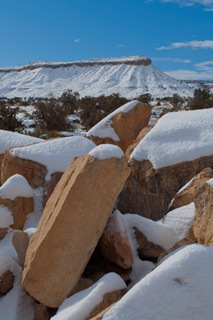 Angular Boulders, Snow Covered Mesa, San Rafael Swell, Utah, 2009 by David Leland Hyde. Nikon D90. A road trip across the Western United States can take many courses. Often when driving from the Denver area to Northern California people travel north on Interstate 25 into Wyoming, then take Interstate 80 west into Utah and Nevada. This route is the fastest by a little over an hour, but it is more developed and goes through flatter, less interesting country than other alternatives. The route I like is direct and nearly as fast, but much more scenic and remote. I take Interstate 70 west from Denver over the Rocky Mountains, down into the Colorado River canyon, through Grand Junction and into Utah’s Canyon Country, past the turnoffs for Moab and Canyonlands National Park, Arches, The Grand Canyon, Capitol Reef, Bryce and Zion National Parks, over the San Rafael Swell, until Interstate 70 meets Interstate 15. To read more about one special trip to some of these destinations see the blog post, “Earth Day Celebration Of Ardis And Philip Hyde And Canyonlands.” I then go south on Interstate 15 a short way to Beaver, Utah, turn west on Utah State Highway 21, go through Milford and into Nevada, onto US Highway 50, the “Loneliest Highway in America,” past Great Basin National Park and Wheeler Peak, through Ely, Eureka, Austin, Reno and into California. 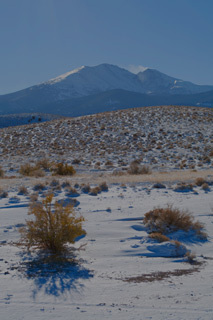 Wheeler Peak With Snow Streamer, Great Basin National Park, Nevada, 2010 by David Leland Hyde. Nikon D90. This itinerary takes me on a traverse of one of the world’s most majestic mountain ranges, the Rocky Mountains, climbing to over 11,000 feet at the top of Loveland Pass. It winds through the enchanting headwaters and upper canyons of the Colorado River and the verdant foothill farmland of the Rocky Mountains’ West Slope. From the great heights of the Rockies, Interstate 70 drops all the way to 4,075 feet when it crosses the Green River in Utah. It then rises again to cross the plateaus, canyons, hoodoos, monuments, bluffs, arches and other spectacular formations of the Colorado Plateau of Southern Utah. With all of this breath-taking scenery left behind, many people consider Nevada plain, but Nevada has an elusive beauty of its own with the roller coaster traverse of Basin and Range, mountains and valleys. Nevada is one of the places where the West lives up to its reputation for wide open spaces. With up to 80-mile straightaways, Highway 50 crosses huge dried up prehistoric glacial Pleistocene lake beds, sometimes still in the form of mud flats, sometimes sprinkled with sage, sometimes lush with grasslands and ranches. Then the “Loneliest Highway In America” roller coaster ride makes a few turns and rises over mountain ranges between the giant valleys. Each mountain range sequesters its own secret old mines, ghost towns, rugged canyons, forests, mountain meadows, rushing streams, snow-capped peaks, small settlements, ranches and mineral deposits. US Highway 50 is a road tripper’s dream, but its beauty is somewhat hidden and subtle, it does not blare at the traveler, but whispers like the ghosts lurking on its dusty side roads. 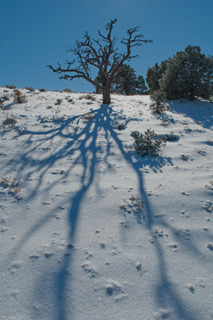 Juniper Tree Skeleton Along US Highway 50, Nevada, 2010 by David Leland Hyde. Nikon D90. In the winter any route from Colorado to Northern California is susceptible to sudden storms, icy roads, blizzards, bitter below zero daytime high temperatures, heavy snows and snow drifts. Driving is risky with few guard rails on the steep, winding, approaches to the passes over the many mountain ranges that run north-south and all but block passage to the unprepared traveler. Any venture through this near wilderness, must not be taken lightly in the winter season and must be planned around the weather. Such adventures must be well-timed to avoid heavy winter storms that pass from West to East across the open expanses and often leave unwary motorists stranded for days in their vehicles waiting for assistance that may never come, or at the least may come too late. So far I have been fortunate most of the time to have good traveling days even in the winter, with only minor snow or rain showers while on the road. One time I drove in horizontal snow with up to five inches on the pavement, not able to see far beyond the front of the hood, just trying to limp to the next town with a motel. In mid November 2010, a low pressure system hit the Western states. This storm system produced heavy snows and temperatures as low as -15 degrees Fahrenheit in mountain towns in Northern California and in Boulder, Colorado, as well as -25 degree weather on the Colorado Plateau in Utah. The roads were treacherous enough to question making any kind of journey at all, but according to the Doppler radar a window of opportunity opened up where it looked as though I could leave Boulder, Colorado and make it over Loveland Pass, out of the Rocky Mountains and down into lower terrain in Utah before the next major rack of clouds and snow hit. Sure enough I made it over the Rockies and into Utah by evening sailing clear. I imagined that I would drive as far as I could before the storm hit, find a good place to stop and wait out the system’s passing over night. 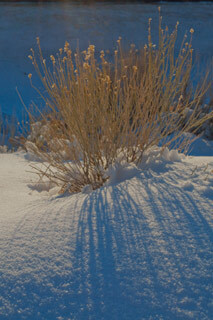 Dried Desert Flowers In The Snow, Along US Highway 50, Nevada, 2010 by David Leland Hyde. Nikon D90. As I breezed through Green River, Utah the sky was still completely clear and full of bright stars and moonlight. From Green River it is about 104 wide open empty miles to the next town of any kind, Salina, Utah. About half-way to Salina the wind started to blow much harder and clouds began to dot the sky. Within another 10 miles tiny flakes of snow mixed in with the high winds. I was still about 40 miles from Salina. As I drove directly into the storm, the snow fell heavier and heavier. Soon it was piling up on the pavement. Fortunately, I was in my truck, which is four-wheel-drive and good at negotiating snow, unless the roads are also icy due to cold temperatures as was the case that night. By this time I was about 30 miles from civilization in Salina, the snow had become very heavy and the road was obliterated beyond recognition, even though Interstate 70 is a four lane freeway in that area. I thought about stopping, but decided I would press on because I didn’t want to get buried in snow on the side of the road. Needless to say, the last 25 miles were very slow and half the time I was merely hoping I was mostly on the road. Apparently the locals and other travelers had turned off for the night and retreated from the storm. I was nearly alone on the Interstate. Then far ahead I spotted a lone big rig truck plowing its way through the mess. I drove up behind and used the big truck’s taillights as a guide, hoping that his sense of the road would prove accurate. This went on for what seemed like hours and then we came up on a snow plow. The truck and I had been going about 10 miles an hour, but the snow plow was going about five miles an hour. The last 12 miles took 2 1/2 hours. I have never been more happy to see a freeway off ramp than that night in Salina. As I slowed even more to nose down the off ramp, my truck began to slide to one side. Fortunately I was able to correct and stay on what was left of the off ramp. I fish-tailed to the right, across and up what looked like the driveway to a local motel. The cheesy, low-budget room with internet access, color TV, half-broken wooden veneer furniture and musty bedding seemed like the coziest room I had ever slept in. 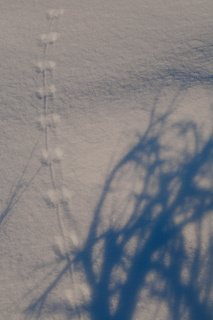 Rabbit Tracks And Shadows Along US Highway 50, Nevada, 2010 by David Leland Hyde. Nikon D90. Morning came quickly as I had arrived late and hit the hay around 2:00 am. I dragged myself to the 1970s era window curtain, pulled it open and beheld a new world. There was about six inches of new snow, but the skies were blue. I waited until around 9:30 am to get rolling, hoping that by then the snow plows would have made a few passes. Once I made it onto the freeway, both lanes were clear and the slow lane was even half dry. I didn’t loose any time as I drove off down the Interstate at near normal travel speed. Driving late into the night was now taking its toll on my body, but my persistence paid off as I had smooth sailing nearly all day except some snow patches on the road on the high passes and some slow-going around Ely, Nevada where there was still a lot of snow on US Highway 50. The real payoff came in the form of the gorgeous scenery freshly covered with new snow. I was on a deadline and couldn’t stop too often, but I did allow myself to stop for as many photographs as I possibly could dare. I made it to my meeting late, but it was quite a day photographing along the “Loneliest Highway in America,” well worth driving one evening in a blizzard and risking getting stuck on the side of the road in the middle of the high desert in the snow.